According to ABI Research, Apple’s CarPlay API for iPhone integration will be dominating the auto industry which will be installed in more than 24 million vehicles in another five years. API in its report points to announcements from over half a dozen manufacturers who intend to install CarPlay in new vehicles which include Audi, BMW, Ford, Jaguar/Land Rover, Mercedes, Nissan, Toyota and Volvo. Apple would be able to reach the milestone with the number of automakers coming on board as partners and the company’s potentials to drive the interest in its latest product, according to report from market research firm ABI Research. Filomena Berardi, ABI analyst, states that `many believe that Apple is creating further fragmentation and ripple effect in the industry by not being open, though with Apple on the scene, it certainly draws greater attention to in-car apps and now with the Android Auto standard on the scene, both will certainly drive adoption of in-car apps’.Apple had unveiled CarPlay, iOS in the car, at the time of the 2013 edition of its annual developer’s conference in San Francisco and had announced the first CarPlay with equipped models at the Geneva Motor Show. This will enable drivers to place phone calls, access contacts, listen to voicemail messages as well as control apps like MLB at Bat and Pandora by using Siri or through their car’s in-dash touchscreen on connecting to a compatible iPhone. 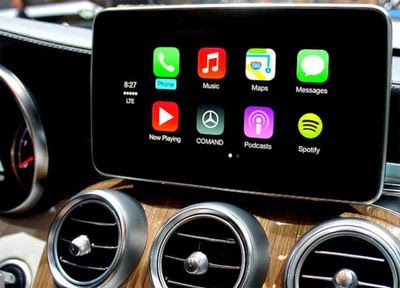 The specification of CarPlay enables an iPhone to be mirrored to a vehicle’s infotainment system at the time the smartphone is being charged and once the infotainment system is connected, the iPhone is controlled by voice, through the car’s built in touchscreen or by steering wheel-mounted controls. Drivers, through CarPlay, will be able to use the voice recognition service, Siri, to have text messages read out loud, reply through voice and obtain contact information from an iOS device in making phone calls. CarPlay also has the option of Apple Maps navigation service and has been competing with proprietary interfaces like in Ford’s Sync system together with industry open source specifications like MirrorLink and GENIVI, championed by industry groups. Search giant Google, earlier this year, announced that it would begin an Open Automotive alliance –QAA while its standards will be dubbed Android Auto and the overall function mirrors that of CarPlay but would be working only with Android devices. API reports that MirrorLink together with GENIVI and QAA have positioned themselves as `open sourced’, and could be considered as competitors which goes against being open. API Research is also of the belief that the uptake of MirroLink would be significant though predicts that additional cars would be fitted with CarPlay and without an open eco system; carmakers will have to collaborate with more partners. Vice President of Automotive Industry Advisory Services at Gartner, Thilo Kowlowski stated that auto makers should do a better job in offering mobile technology or have it taken away by rivals in the technology industry. Koslowski further pointed to Google, its self-driving car, digital distribution platforms like Google Play together with in-car smartphone connection platforms like CarPlay with signs of improved facilities in store.